If you have been following me on social media recently, then you know I've made my way to New York City for Fashion Week. It's such a fun time for me and I love that I get to do it with my favorite gal, Marisol from Mari Estillo. Every February for Valentine's Day, I'm usually in NY with her doing all fashion week events. This year we decided to go out on a Galentine's date to celebrate the month of love together. We are in the Big Apple during the week of Valentine's, so why not celebrate our friendship?! Keep on reading and see how I get ready for my Galentine's date in NYC! As much time as I dedicate to my outfits when I go out, I love to give my hair some TLC too. I always start with a wash because I love fresh hair to go out. I'm a haircare product junkie and I'm very picky with my hair products. I only use products that have good benefits and natural ingredients for my hair. SheaMoisture is one of those brands for me: I've been a fan of their products for as long as I can remember. 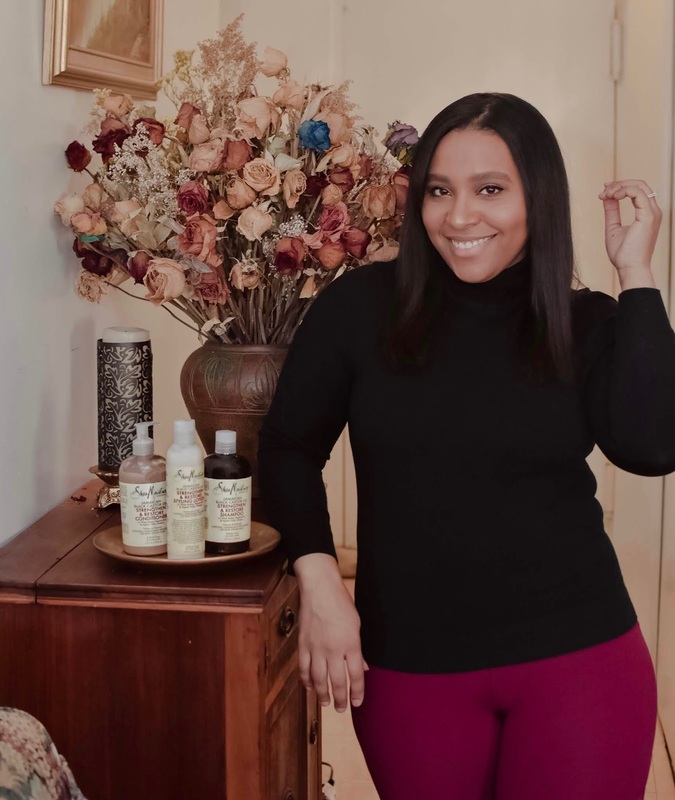 The SheaMoisture Jamaican Black Castor Oil Strengthen & Restore Shampoo and SheaMoisture Jamaican Black Castor Oil Strengthen & Restore Conditioner are amazing! The shampoo is sulfate-free and leaves your hair smooth and shiny. It strengthens damaged or chemically processed hair and, if you guys read my hair journey post here, you know how much chemicals I used to use on my hair. I'm talking toxic perms, as well as trying every hair color dye in the book. People compliment my hair so much now but it was a long journey. Products like SheaMoisture with key ingredients have helped restore my hair. The conditioner also smells amazing and has a nice consistency to it. Big plus for me that it has a little pump to get the product out. It's formulated with Jamaican black castor oil and organic shea butter, which helps nourish and give your hair moisture. Hover over the image above to get more product information and you can also shop them! I love that they are affordable and you can find them in your nearest Walmart. While I blow dried and straightened my hair, I used the SheaMoisture Jamaican Black Castor Oil Strengthen & Restore Styling Lotion. It protects your hair from the damaging effects of heat styling and it increases the hair's resistance to breakage. It also leaves an amazing shine on the hair. I feel like my hair is not complete on wash day if I don't have shine, so I always opt for products that leave hair with shine for styling. Date time with my favorite Gal! We both love hanging out in New York City and we took a day to explore, eat, and take pictures around the city. After all... we are bloggers. We love finding pretty street corners and taking pictures. Thank you Marisol for our Galentine's date in the city. You're a great friend and fashion week partner in crime! Are you guys celebrating Galentine's / Valentine's Day? How do you prepare for a fun date day with a friend or significant other?